CRE1 Triton Series is a new generation of IP55 corrosion-resistant washdown heaters. The European compliant heater with models ranging from 2.5 kW to 40 kW. 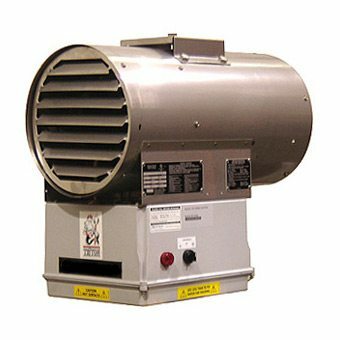 IMPORTANT: CRE1 heaters are suitable for non-hazardous locations only. For washdown applications use water pressure less than 482 kPa only. Motor type Thermally protected, ½ HP, 1725 RPM, permanently lubricated ball bearings. Fan Epoxy coated, aluminium blade, steel spider. Inlet Grille Type 304 stainless steel, minimum 1.21 mm thick, 6.3 mm maximum openings. Discharge Grille Type 304 stainless steel, minimum 1.21 mm thick. Rotatable in 45° increments. Mounting Bracket Type 304 stainless steel, minimum 1.21 mm thick. Universal mounting bracket. Heating Elements Type 321 stainless steel sheath with Type 304 stainless steel spiral fins. Optional manual reset, stainless steel bulb and capillary. Replaces automatic reset. Control Transformer Multi-tap primary, 120 V secondary, 50 VA.
Contactor 40 or 75 amp. Rated for 500,000 mechanical operations. 120 Volts, 15VA coil. Cabinet Material Type 304 stainless steel (1.52 mm). Temperature Limitations Storage: -20°C to 60°C.